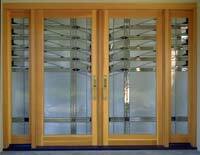 Leaded-glass doors offer a special greeting to all who pass through them. Winking iridescent panels and beveled jewels flash a welcome in the sun's reflected rays, while softly glowing interior light whispers warmth to nighttime callers. Splashing soft pools of color or dazzling rainbows across floors and walls, glasswork can brighten your entryway while preserving the privacy of your home. 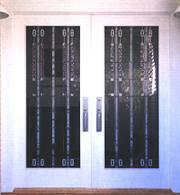 Arthur Stern Studios specializes in producing custom glass detailing to enhance architectural and interior design. By working closely with the shapes, rhythms, proportions and materials of interior and exterior environments, we create works of art that are an integral part of the building. Our recent projects range from a single door for a houseboat in Sausalito, California, to double-door entrances for luxury homes in Michigan and Florida, to forty-three entrances for luxury condominiums at Chambers Landing in Lake Tahoe, California. Careful attention to craftmanship ensures that our glasswork will age gracefully, bringing pleasure to generations yet to come. 1"-thick slab-glass dalles are saw-cut and cast in an epoxy matrix with aggregate (sand) on the surface. This style of art glass creates a positive-negative effect. The epoxy reading as negative, or black, space. The irregular window openings are a response to the graphics of the design.